In 2016 Those Funny Little People began a new relationship with UK and Las Vegas based Scarlett Entertainment. Their first assignment was to travel to Dubai in the United Arab Emirates for the post Ramidan Summer Celebration. "Ted and Telli" posed for thousands of pictures, making new friends around the world! 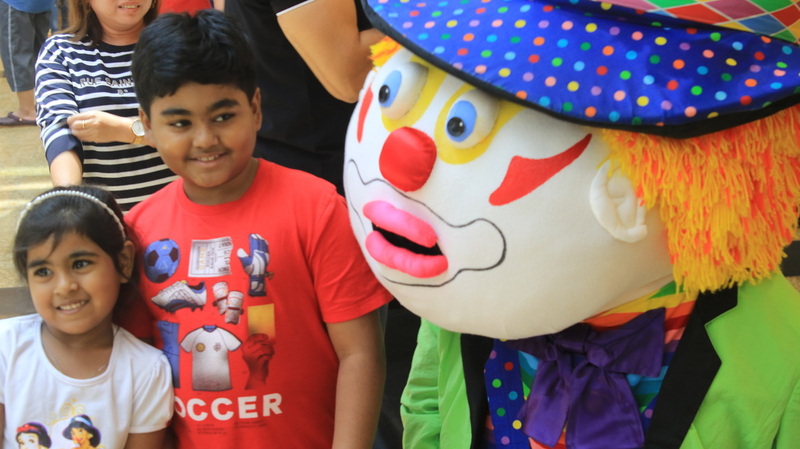 Our Little People clowns, "Ted and Telli", made five appearances a day at the Mall of the Emirates in downtown Dubai. This Mall has 600 stores, 100 restaurants, and even a Ski Slope. 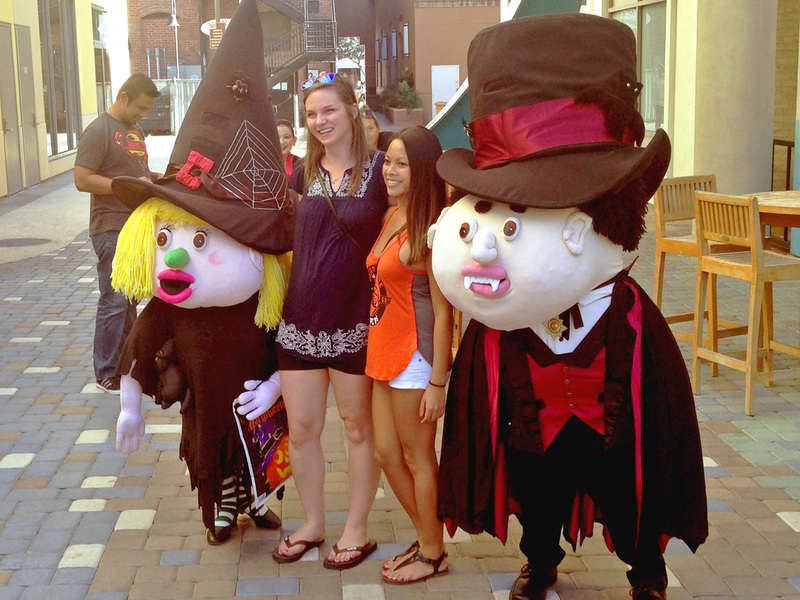 They were welcomed by shoppers from all over the world visiting and vacationing after the holiday. Our Little People were one of several acts that the UAE hired to appear in the Dubai malls for this month long celebration. In 2014 the A Team crew sent our Christmas Elves, "Wally and Abby", to Kuala Lumpur, Malaysia where they appeared for eight days over the Christmas Holiday at the “The Mines” shopping center. Certainly a big change from the North Pole, "Wally and Abby" were happy to spend their Christmas together in a balmy and humid 90 degree climate! "Wally and Abby" made five appearances a day, and were joined on stage by Santa and other holiday entertainment. The multicultural shoppers in the Kuala Lumpur area loved their show and all of the hilarious interaction! In 2013 Those Funny Little People were hired by The A Team Productions in Singapore to appear for the Christmas Holiday at the Parkway Parade Mall for a nine day stretch leading into the Christmas holiday. They made five appearances a day doing shows and roving entertainment as "Wally and Abby", the Christmas Elves. They made such an impression on the people of Singapore, and the A Team production crew, that they were asked to return as the Trick or Treaters "Count Smakula and Witch Wanda" for a five day Halloween promotion in 2015. The Halloween tradition is relatively new to Singapore, and is being embraced by the culture at Shopping Centers and festivals. Hi gang, Max Diamond, agent extraordinaire here. What an exciting start of the year. 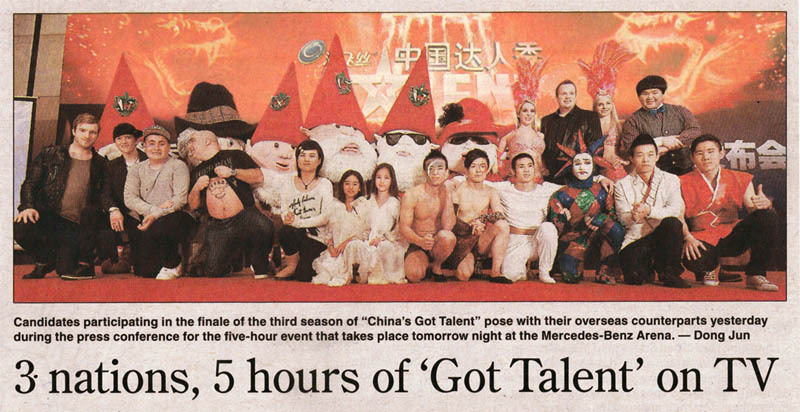 Lola, Ice, James, Curtis, Wally and myself were all invited to perform on the third year's season finale of China's Got Talent. We accepted the invitation and, even after sitting on a plane for 15 hours, we were thrilled to be in one of the largest cities in the world--Shanghai, China! A press conference was held for all the Chinese contestants and guest performers. So we met some very friendly and talented people from all over the world. Stavros Flatley, Jai McDowall and George Sampson - just to name a few. Lucky for Lola we had some down time to shop before the big show. While we were out and about, the Chinese people were quick to introduce themselves to us. Many of them wanted pictures! They made us feel right at home. News article from the Shanghai Daily. Click to read the full article. On the show we had the opportunity to sing with Zhu Jie, season one's winner, to Somewhere Over the Rainbow. The boys and Lola did their rendition of Singing in the Rain and Raining Men. Lola insisted that there be 100 background dancers. I pulled some strings and was able to get 40 dancers. I thought that was good enough. Our last day in China was the eve of the Chinese New Year. Everyone went out to celebrate. I went back to the hotel when James and Ice spent 1000 yuan on fireworks to set off. All in all, we had an amazing experience in China. Shanghai is an impressive city and the people were wonderful. We are honored to have been invited to China and to have performed with all the astounding talent! __ The show was to take place at the Mercedes-Benz Pavilion to an audience of more than 18,000 people. As part of a week-long Chinese New Year celebration, the episode would be broadcast on Chinese television to more than 500 million people worldwide. Wally did have a small nervous breakdown when he heard that over 500 million people would be watching. When Ice asked Wally if he was an Elf or a chicken, things got a little out of hand. There was a lot of arguing and name calling while Wally sobbed. But in the end everyone was able to reconcile and we all put our game faces on. 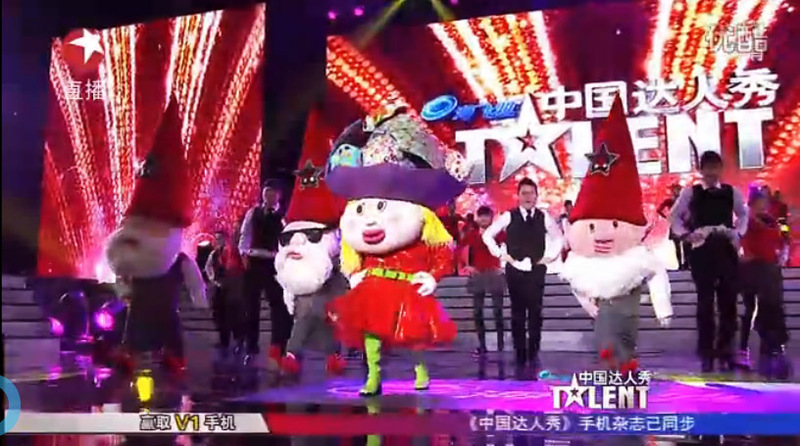 Performing on stage for China's Got Talent. Click to watch the full performance.